Latkes, fritters, doughnuts, sufganiot cannot hold a candle to these sephardic Hanukkah sensational fried burmuelos! Since my mom made sure the food in our home was on the healthy side and a definite no-fry zone, it was always an exciting treat when my grandmother came over to make burmuelos, warm, crispy, fluffy, free-form doughnuts. Bumbles (a.k.a. burmuelos) are a tradition that escaped with my ancestors, exiled from Spain in 1492, traveled through Italy and on to Turkey, to settle firmly into our family holiday recipe repertoire. When Chanukah rolled around, Grandma felt she had license to pour enough cups of oil to clog even our youthful arteries into one of my mother's heavy pots. Then she magically extracted the most heavenly clouds of puffed dough that she drizzled with honey or powdered sugar. I think I even remember seeing Mom enjoying a few of them too. 1. In a small bowl, dissolve yeast in warm water and allow to stand for 10 to 15 minutes, until bubbly. 3. Meanwhile, in a saucepan over high heat, bring sugar, honey and water to a boil for 5 minutes. Remove from heat and keep warm. 4. Heat oil in deep fryer to 325 degrees or set a large heavy pot with 3" of oil over medium high heat. The oil is hot enough when a light sprinkle of flour over the oil bubbles immediately. 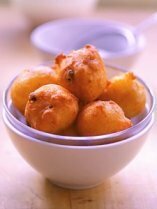 Gently drop 2" balls of the batter into hot oil, being careful not to spatter hot oil. For best results, do not crowd burmuelos. Fry for 3 to 5 minutes, flipping once, until burmuelos float and are golden and puffy. With a slotted spoon, remove to a serving dish. 5. Pour honey or powdered sugar over hot bumuelos and sprinkle with cinnamon. Serve immediately. cannot make (entirely) ahead, cannot freeze, cannot wait to eat them! The Kosher Channel has pages of inspiration and Chanukah meal ideas to go with this delicious sephardic Hanukkah recipe.